Hull City midfielder Ryan Mason has had surgery after fracturing his skull during Sunday's game at Chelsea. 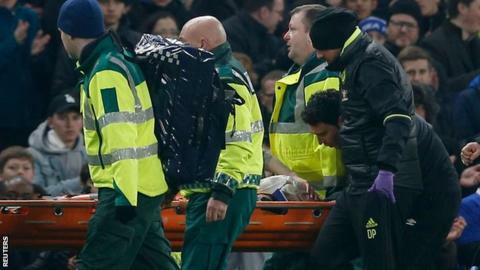 Mason, 25, clashed heads with Chelsea defender Gary Cahill 13 minutes into the Premier League match. After eight minutes of treatment on the pitch, he wore an oxygen mask as he was carried off on a stretcher, and taken to St Mary's Hospital in London. "Ryan is in a stable condition and expected to remain in hospital for the next few days," said a Hull statement. Hull added they would issue a further update on Monday. The incident happened as Hull's record signing attempted to head the ball clear of his own box following a cross from Pedro from the right wing. Mason got to the ball a split second before Cahill, who was already committed to his attempted header, and the pair collided. Both players spent a lengthy period receiving treatment. Cahill, who continued playing, said: "I tried to get on the end of the cross. We smashed heads. I wish him all the very best." Mason joined Hull from Tottenham last August for a club-record undisclosed fee. He has scored one goal in 16 Premier League appearances for the Tigers. Prior to his move, he made 53 top-flight appearances for Tottenham, and had loan spells at Yeovil, Doncaster, Millwall, Lorient and Swindon. Hull lost Sunday's game 2-0 as goals from Diego Costa and Cahill gave Chelsea a victory that took them eight points clear at the top.